The AGBAR Mediator and Director General meet the ENGIE Group Mediator and some of his team. 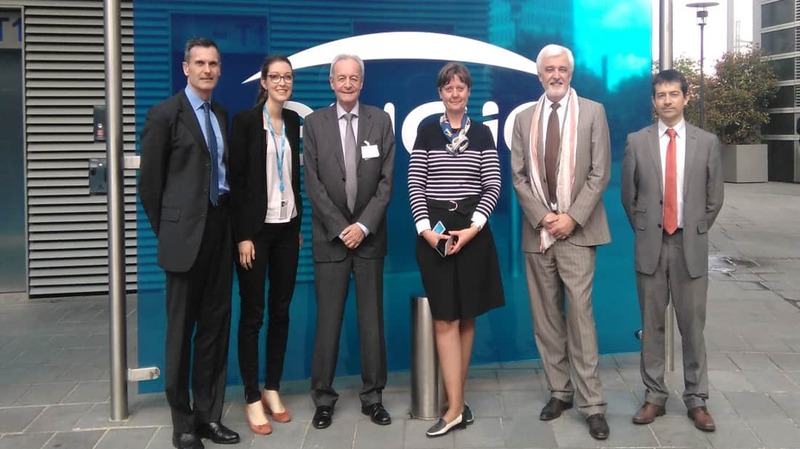 Accueil > The AGBAR Mediator and Director General meet the ENGIE Group Mediator and some of his team. The Agua de Barcelona Mediator (AGBAR – now Suez Spain) was created 5 years ago with the aid of the ENGIE Group mediation team: the 2 mediators and their teams have collaborated closely, and through their regular sharing of good practices this has enabled the AGBAR Mediation team to set up a scheme now recognized in the company that is beginning to be emulated in the rest of the SUEZ Group. On Thursday 21 May last, Lluis Martinez Camps, AGBAR Mediator (Customer Counsel) and Sergi Sanchis, Director General, met the ENGIE Group Mediator, as more or less every year since this company mediation entity was created. The purpose of this meeting was to continue sharing good practices, more particularly in connection with AGBAR‘s anticipated preparation of the future transposition of the European ADR directive of 2013 into Spanish law. The transposition of the ADR Directive into French law and the expected requirements of the new law (order of 20 August 2015) concerning the independence of the Mediator, and the mediation processes offered to claimants. If they so wish, the AGBAR Mediator and his team can henceforth draw on this learning from experience of the ENGIE Group Mediator. The methodologies and communication channels used by the ENGIE Group Mediator to make his existence even more well-known to stakeholders, both within the ENGIE Group and externally, in particular the claimants themselves. The Mediator notably presented the methodology for setting up an independent web site, in December 2015, which offers the possibility of obtaining comprehensive information on the ENGIE Group mediation team in a fully transparent manner. The complaints handling processes and the minor changes made to these processes in the context of the Mediator’s approval as Consumer Mediator (25 February 2015). the way in which the AGBAR mediation team handles the follow-up of the recommendations it makes, every year, in its annual report, to the Group’s companies. the mediation development plan, led by the AGBAR Mediator, in Suez subsidiaries in South America. The day ended with the promise of further and more regular meetings using more modern methods (videoconference) to enable more frequent sharing focusing on specific topics. At the very least the forthcoming meetings will focus on development methods and tips for a web site.